In this guide we will show you how to find and unlock the Pack a Punch in the final DLC Revelations for the Call of Duty: Black Ops 3. Before you proceed, you need to find and activate all four corrupt engines and switch on the power. Here, you have to spend 500 points for each machine. Follow the below given link to the corresponding guide, if you were not able to solve this task. Once you have succeeded, you can go through the portal and follow the steps given in the list. - Make sure that all four lights are green, in case if you find a red light that means you have not activated one of the corrupt engines. - Now wait until the giant creature is front of the electrical now you can activate the Tesla death ray to shock the giant creature. - Right of you there is a staircase; take this to get to the giant creature and when you come closer to his mouth you will immediately sucked. - Go inside until you find yellow orb / heart - connect to 3 veins - like a bag hangs down from the ceiling. Shoot them off to get the Pack a Punch. 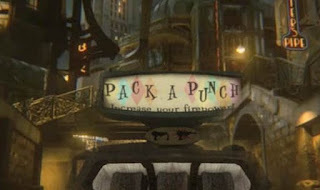 Now you can upgrade your weapons and the Pack a Punch will cost you 5,000 points. You can always go back and use this machine again and again. Turn now to the right and leave the giant creature on the blue gear. Now you unlock the Pack a Punch Ectomy achievement.